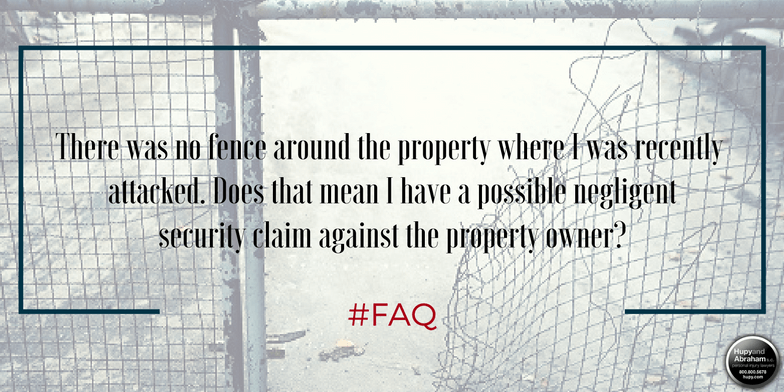 Does Lack of a Fence Mean You Have Negligent Security Claim? | Hupy and Abraham, S.C. There was no fence around the property where I was recently attacked. Does that mean I have a possible negligent security claim against the property owner? The lack of a fence around a the property may be relevant to a possible negligent security claim that you could file against the owner of the property, but this fact alone does not automatically give you the right to recover damages. The law requires that property owners keep their properties safe for their guests, but the law does not require that property owners use any specific means of security to make that happen. Fencing would have likely stopped or deterred the person who attacked you from entering the property. There were no alternative security features in place that reasonably would be able to prevent an attack. Thus, the lack of fencing is certainly something that you should talk about with your lawyer if you are considering a negligent security case. If you have been hurt in an attack, then you deserve to know whether or not you have a potential negligent security claim and what kind of damages you may be able to recover if you pursue such a claim. The person who attacked you may not have the financial assets necessary to compensate you for your injuries. However, if the property owner was also liable for your injuries because the property owner failed to provide reasonable security then you may be able to recover for your past and future medical expenses, lost income, out-of-pocket costs, pain, suffering and other damages from the property owner or his insurer. To find out more, please read our FREE report, Negligent Security: What You Need to Know About It, and please start an online chat with us now to get your individual questions answered.